Five entries - five trophies ! This was the record of five local members who crossed the Red River to engage the Texans at the Ft. Hood Hill Climb on March 3 - 4. 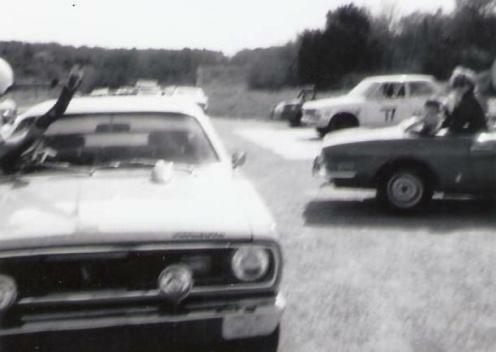 This was a new event, non - SCCA, but run in our Solo II classes. The course measured exactly one mile in length with nine turns and was a real challenge. Running in C Stock, John Saucier took 1st in his new Porsche and new member, Rob Berry, finished 3rd in his 24OZ. Alan Cadwell trailered his Midget to the event and with co-driver, Steve Smith, took 1st and 2nd respectively in F Prepared. 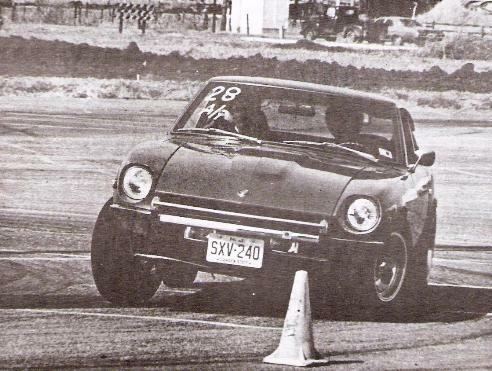 George England won 1st in G Stock with the Datsun 510. A study in haberdashery circa 1973. Afro, collegiate, "Tams", handkercheif, pigtails, bush hat, cowboy hat. Left to right: Bob Berry, Steve Smith, Sandra Saucier (with Geraldine) John Saucier, George England, Margaret England, Elsie England (with Stephanie) Steve England and Alan Cadwell. Besides these travelers, Oklahoma Region was also represented by Steve England who is also a member of the Ft. Hood Club and who personally invited our participation. Steve, driving against Alan’s Midget had to settle for a 5th place in the old Volvo. Participating as pit crew for Okie drivers were Sandra Saucer, Margaret and Elsie England. George England wrote a "Nostalgia" column story about this event, but I'll be darned if I can find it. So here's my first hand report on this truly unique event. 1973 was a special time at Fort Hood. 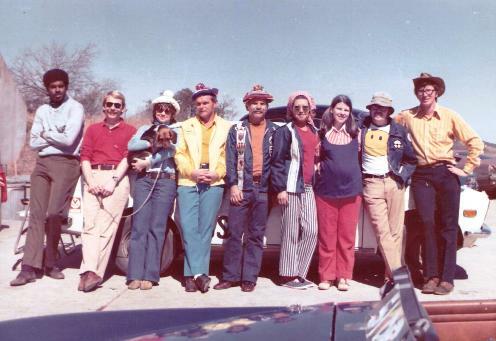 The "Fort Hood Sports Car Club" (SCCFH) was going gang busters because the US Army had emphasized any and all recreational activities to recruit new soldiers under its "All Volunteer Army Program." The Texas Spokes Sports Car Club had successfully held its annual Buchanan Dam Hill Climb at Lake Travis for a number of years, and SCCFH wanted to emulate that success. Event Chairman Jon Van de Carr chose the roads around West Fort Hood for the event. West Fort Hood was, and still is, a special historical area. Prior to 1958, the US Air Force maintained a little known Air Base West of Fort Hood. 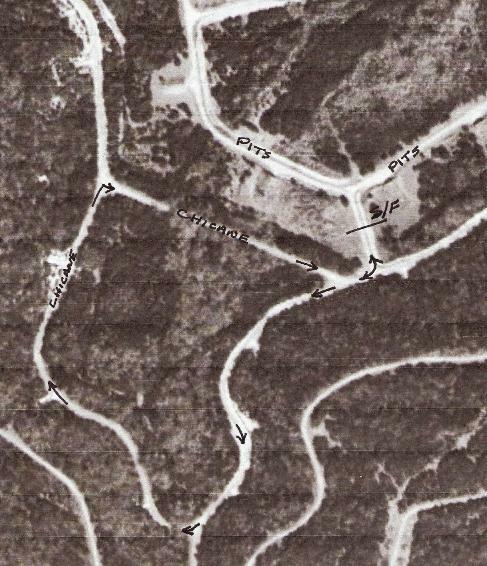 Besides a really long run way, the base featured many bunkers hollowed out of the granite hills, connected with miles of roads. Every nuclear bomb, and their fuses, were stored there. In the event of war with Russia, the B-36s and B-52s would land at the base and "load up". Most Texans were unaware of having mega kilo-tons of destruction just down the road from Killeen. The course Van de Carr chose was virtually flat, except for the small climb out of the pits, with a return down to the start/finish. Thus the name Mini Hill Climb". Pylon chicanes were set up on the two longest straights to keep the speeds under the Texas legal limit (wink, wink) of 70 mph. The course was heavily vegetated, as one contestant in a Plymouth Duster found out when he ventured off course and "speared" a 6" diameter tree branch with his windshield ! Captain Rob Berry was almost a celebrity here. Hailing from New Jersey, he drove a wickedly fast 240Z, and he was the only African American contestant I can remember in my three years in Central Texas. I don't have any results other than noted above, but the event was a howling success, with almost 100 entries. I left Fort Hood a month after the event, and I don't know if it continued.